Well, this is a book I had high hopes for that did not quite live up to my expectations. However, that in no way means it was a bad book. I simply was looking to be moved by it in the same way I was by a handful of other nonfiction titles this year (Just Mercy, Hillbilly Elegy, American Fire), and that just did not happen. 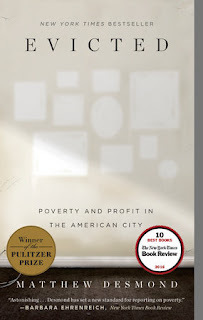 Evicted by Matthew Desmond is an incredibly detailed behind-the-scenes look at poverty, rental properties, and evictions in Milwaukee. It has won numerous awards and is being heavily praised. For me, the most interesting part of the book is the ending when Desmond tells you how he approached this work as a journalist. Learning how he got close enough to learn the secrets was truly fascinating. However, the stories themselves were not as interesting to me. I believe this is because it was the same sad story told over and over again. This is probably part of the point though - this is an ongoing battle in a vicious system, so we need to acknowledge that these problems are recurring and the cycle is continuing. But, reading the different stories over and over again was not as moving as I expected it to be. With that being said, while I might not have been moved to tears, it was clearly eye-opening. I learned quite a bit I did not know (and most probably turned a blind eye to). For example, I had not stopped to think about the people who make money off of those living in poverty. Desmond refers to one individual as an inner-city entrepreneur. She owns their crumbling homes and offers transportation to visit family members in jail. And, then, she kicks them out when times get hard. 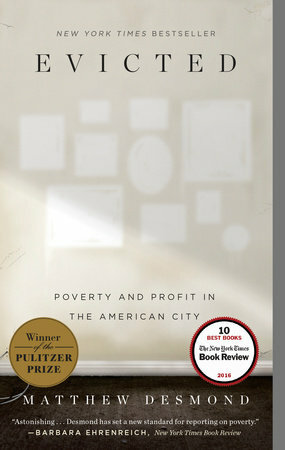 This book delves into the bleak world of poverty, evictions, welfare, and city planning. Desmond carefully demonstrates the struggle to pay the rent and feed your family - especially when the rent takes up most of your pay. I won't say it is a must-read, but it is an illuminating and challenging read.